The way to a man’s heart? 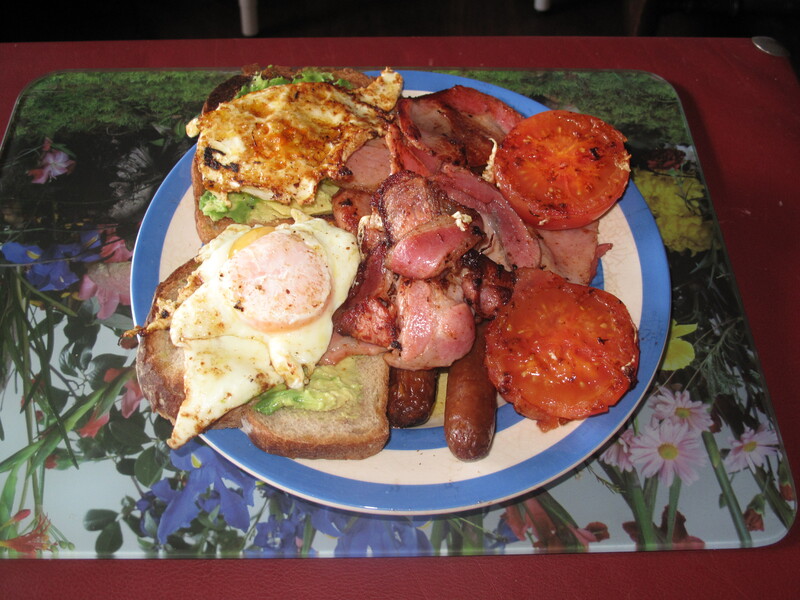 Ming’s Sunday breakfast: I spread half an avocado on two pieces of wholemeal toast, then cooked eight bacon rashers, two sausages, three eggs and one tomato. It took me around 10 minutes to prepare. It took Ming exactly four minutes to consume. I took Anthony out to the Dome this afternoon where he demolished an enormous piece of chocolate mousse cake with extra cream. I sipped my coffee and watched in amazement. After taking Ants back to the nursing lodge and settling him into his room, I came home to find Ming sitting in the living room hungry. I am not sure if he has forgotten where the kitchen is, or forgotten how to open the refrigerator which generally has food in it, but he appears to have some sort of mental block when it comes to feeding himself. So I gave him his requested snack of strawberries and cream with some reluctance. He ate it unreluctantly. Ok that breakfast looks amazing! food has power. any chance anyone in your family is related to anthony goyder from bunbury? Full breakfast, nothing can beat that … but I couldn’t eat every morning – never had it with avocado *smile I could have a big piece of chocolate cake for breakfast nearly every morning and with strawberries I could live every day, but without the cream. You men love their food … love men that can eat. Anthony are looking great on the photo. I’m glad the men in your life are eating well. I hope you have a minute here and there to produce something nourishing for yourself. Nothing more fun than cooking for teenage boys! Glad everyone enjoyed their treats. I’m hungry! I sure can relate to feeding those hungry hearts. I was really good at that, too. I see strawberries in my sleep. You are a very nurturing woman. What I want to know is, did you eat anything yummy? 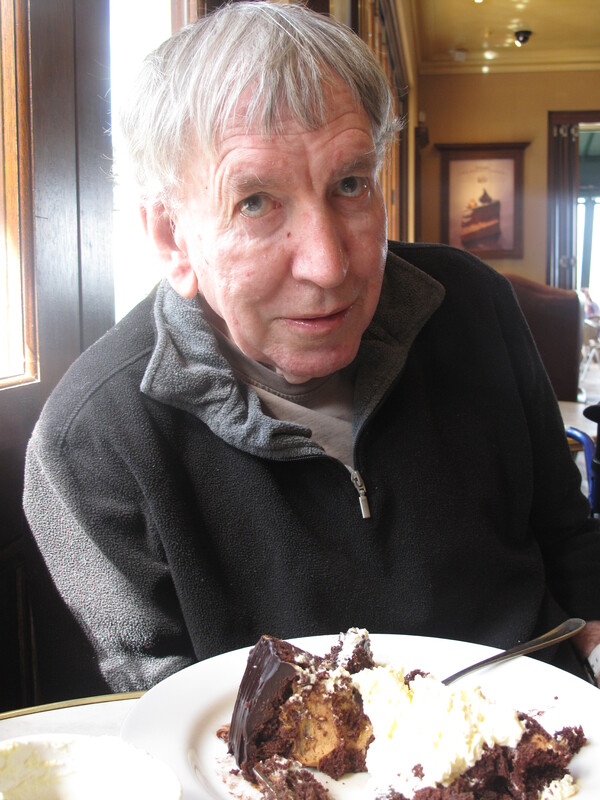 I was usually tasting things as I went along, never really indulging with enjoyment. But I’m sure I consumed more calories by stress eating! What a breakfast! Think the avo would tip it over the edge as being possible to finish but that boy should know how spoiled he is. Anthony didn’t do half bad too. Mouth watering dishes 😀 I love your comments about Ming not being able to find the kitchen. The men in my household occasionally develop the same kitchen-blindness 🙂 Ant looks lovely in the picture. I had three boys and a hyperactive husband and during the boys teens the volume of food consumed was astronomical. Men and boys, sometimes it seems they think of nothing lese except food. Your boys are lucky to have you! Breakfast of champions! Very nice photo of Ants. Those desserts look yummy. Gosh, you are such a good mom and wife! And I will take the avocado. Don’t let anyone else tell you to leave it out! I think of feeding people as a way of making them feel loved. Nate knows how to cook, but sometimes when he comes to our house hungry, I know he wants to feel loved–and so I feed him. Geez, Ming can eat faster than me. I inhale my food, but not that fast. I would love a breakfast like that. 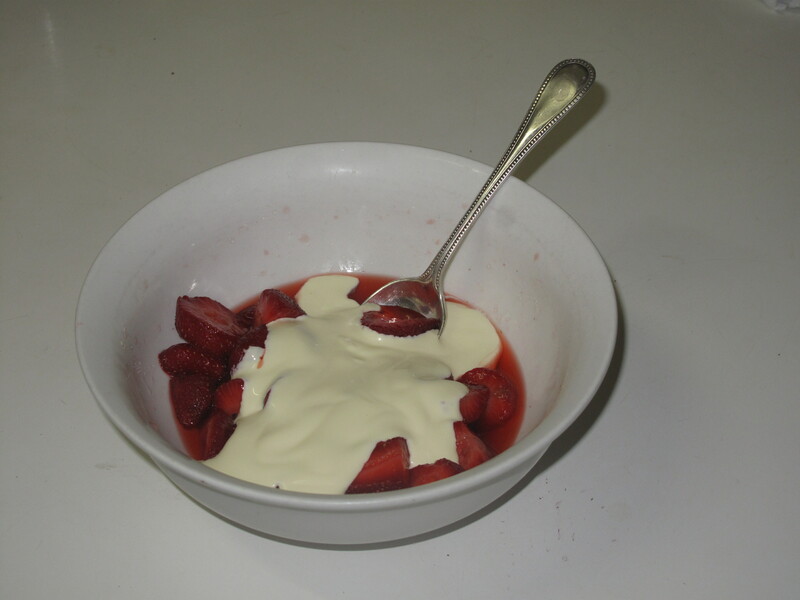 And the dessert and strawberry and cream … I’m hungry …where’s the fridge/chef? Wow! That is a breakfast of champions! Glad to hear Anthony can still enjoy food with a good appetite. Pleasure in small things. Wow! Somebody should hire you out as a chef! Beautiful, manly plate!